Beginning Drupal 8 teaches you how to build, maintain, and manage Drupal 8-based web sites. The book covers what Drupal is, using Drupal when building a new web site, installing and configuring Drupal, creating and managing content, managing users, adding functionality to your web site through Drupal modules, and advanced topics on using themes, panels, and views. 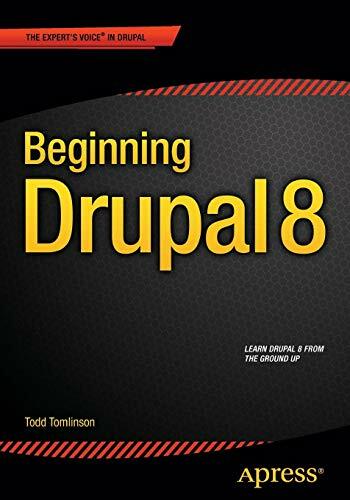 The book also builds practical examples of common Drupal sites, such as a company website, a community website, and a commerce website, that you can take and expand on to create your own Drupal 8 sites. By reading this book, you will understand the power of the Drupal platform, and why you should be using Drupal if you're not already. Through following the samples in the book, you will quickly build your confidence and your ability to use Drupal. Beginning Drupal 8 gives you the knowledge necessary to build, deploy, and manage web sites on Drupal 8.